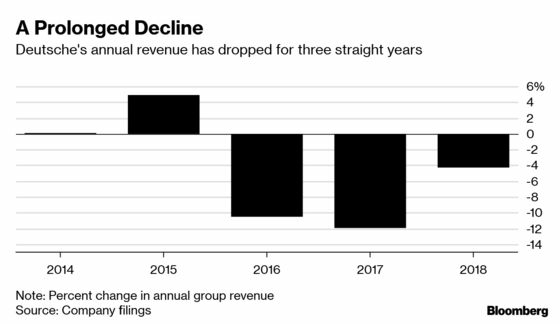 (Bloomberg) -- Deutsche Bank AG pledged to reverse years of declining revenue and kept a key profit target intact, striking a more upbeat tone than some rivals as it starts merger talks with Commerzbank AG. The defiant outlook -- just two days after UBS Group AG warned that the first quarter was one of the worst environments in recent history -- lifted Deutsche Bank’s shares and may strengthen Chief Executive Officer Christian Sewing in talks with investors on the merger. Sewing in the past year accelerated a turnaround plan focused on cost cuts, but the failure to reverse revenue declines has been seen as a key weakness. Deutsche Bank rose as much as 3.3 percent and traded little changed at 10:18 a.m. in Frankfurt. The lender lost more than half its market value last year. Deutsche Bank and Commerzbank announced formal merger talks last weekend after struggling with separate turnaround plans. Germany still owns 15.6 percent in Commerzbank, and the Finance Ministry favors a merger to support the small and mid-sized companies that are the backbone of the export economy, people familiar with the matter have said. Germany’s slowing economy and continued low rates have added to the urgency. Sewing has said previously that he wants to restore revenue growth this year, and he set a full-year target for a 4 percent return on tangible equity, a common measure of profitability. 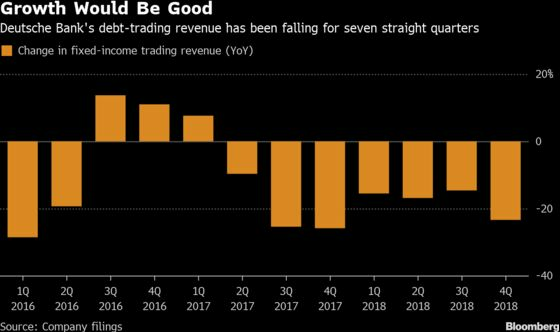 Revenue in 2019 should be “slightly” higher than last year, assuming “solid” economic growth, the Frankfurt-based lender said Friday. It maintained the profitability target but said that goal remains dependent on how markets develop. “Market conditions have improved as compared to those experienced in the fourth quarter of 2018, however, they are somewhat weaker than we had anticipated,” Deutsche Bank wrote. Click here for a QuickTake on Deutsche Bank’s troubles. Analysts polled by the bank are skeptical it will succeed -- their consensus estimate anticipates a decline in revenue and a return on tangible equity of less than half Sewing’s goal. January was a terrible month for the trading business at Deutsche Bank, though February saw an improvement, people familiar with the matter have said. Executives at both Citigroup Inc. and JPMorgan Chase & Co. warned in recent weeks of weaker trading revenues compared with a year ago. At UBS, CEO Sergio Ermotti said there has been very little merger or initial public offering business outside of the U.S., with investment banking revenues down about one third compared with a year ago. The Swiss bank will slow down hiring and deepen cost cuts by about $300 million, he told investors on Wednesday. The Swiss bank’s downbeat outlook sent bank shares lower across Europe. Read more about efforts to put excess cash to work at Deutsche Bank. Deutsche Bank said that Brexit, global trade disputes, central bank policies and levels of client activity could all impact its outlook.